Today, we are participating in the emergence of a new economy, the limit of the possible rises in a working world in full transformation. We invent new forms of governance, companies have to adapt, open up and orient themselves to projects that combine talents. We move into a world of collective intelligence. We reinterpret the beginnings of Humanity, when ability to cooperate was one of the major options for the group’s survival. But sometimes this collective intelligence comes up against culturally acquired individualism. In order to maintain cohesion within a collective work, it is necessary to share values, trust in the other, so that everyone feels well in his role, responsible for his actions, in favor of the group. This new Ergonoma Journal’s edition marks the twelfth year of its existence. Beyond the answers we are trying to give about improving the quality of material life in the company, health prevention, ergonomics and well-being at the workplace, you will read in this issue a Focus on Light: ” At the workstation, good lighting is a key factor of satisfaction and performance of the workers.” We offer a number of topics for discussion, such as “The eight factors transforming the way we work” as well as ” Impact of pain on society costs the EU up to 441 billion Euros annually ” and our usual rubrics. On behalf of the whole team I wish you a wonderful summer. 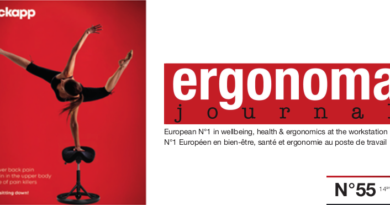 As for us, we will always be on the spot, exploring the trends, products and processes that “work”, for Ergonoma Journal to remain at your side the “turnkey” service for transforming your businesses.